"Schmidt-Nielsen was born in Trondheim, Norway, in 1915 and became a U.S. citizen in 1952. 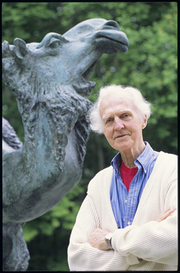 Educated in Oslo and Copenhagen, he spent two postdoctoral years at Swarthmore College, a year at Stanford University and three at the University of Cincinnati College of Medicine before coming to Duke in 1952. He published 270 scientific papers and five books that were translated into 16 languages. He also received numerous awards, including the International Prize for Biology, the Japanese equivalent to the Nobel Prize in the biological sciences. Knut Schmidt-Nielsen is currently considered a "single author." If one or more works are by a distinct, homonymous authors, go ahead and split the author. Knut Schmidt-Nielsen is composed of 5 names. You can examine and separate out names.